Winter is not gone yet here in New Hampshire. Spring on the calendar means nothing really. On the first day of Spring it snowed and was very cold. My outdoor thermometer broke a long time ago, so I don’t keep track of the temps, but this week it will be close to 50 and that is the warmest it’s been in many months here. It will come with rain, so we’ll still be stuck indoors, but to open my cupboards and have them not feel like a refrigerator will be a nice change. In your neck of the woods, it may feel like time to get the gardens cleaned up and the seeds started. All this still seems a long way off to me. And that’s fine. Because of the ice dams that were created with the non-stop February snow storms, I have damage to get fixed inside my house. I need a new roof, but can’t afford that, so I’ll do what I can. Home fixes and improvements are what I have on my mind after surviving the bad winter we just had. I try to ignore all the clean up that will be needed once this icy snow melts. It will not all be gone for a long while. 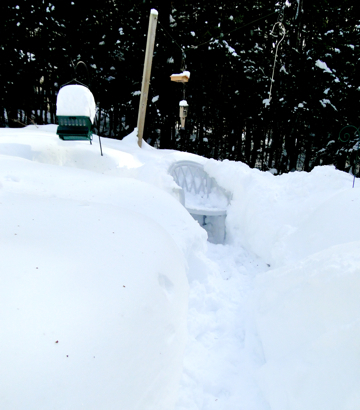 What you see in the picture of my backyard (above) has gone down to about half. I had to have the roof shoveled in February, and that made big piles of snow all around the house. So I have no hydrangea news to report. The only hydrangea flowers I’ve seen are the ones on the paper I make for the BlueHyd store. I’m hoping the ones in the yard will look fine once the snow goes away. At least the sun is stronger and having bright days is a wonderful gift!